I'm originally from a science and engineering background. I have a degree in Chemical Engineering and worked as a software developer for many years. I got into writing non-fiction books on martial arts but then moved over to writing fantasy gamebooks. What inspired you to write gamebooks? Back in the 1980s I used to play Dungeons and Dragons and Fighting Fantasy books. I read The Warlock of Firetop Mountain when it first came out and this inspired me to have a go myself: I wrote my first gamebook adventure when I was eleven years old. It was terrible! It was called Caverns of the Cyclops and was hand-written in pencil in a small notebook. Tell us about where your gamebooks are set. The Adventure Begins Here books are set in a region called Norland and follow the adventures Toby of Endersley who is a squire, in training to one day be a knight of the realm. The land is kept pretty peaceful and safe by the king's knights, who are there to deal with threats by force of arms, and the guild of magic, who describe themselves as guardians of the secrets of magic and have a more non-interventionist philosophy. However when one of the top sorcerers decides that he has bigger ambitions and goes rogue, the events in The Renegade Wizard kick off and Toby is launched on his first adventure. What inspiration did you draw on for your gamebooks? Apart from the Fighting Fantasy books, I was influenced a bit by the Grailquest adventures. When you have to make arbitrary decisions without any reason for picking one over the other. The old "Turn left / turn right" situation. this is even worse when a wrong choice leads to an unfair death. I think that a really great gamebook has to give the player a strong feeling of self-determination. 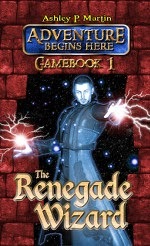 Obviously the nature of the format requires that the player doesn't go too far off the rails and stays following the central storyline of the book, but a cleverly written book with give at least the illusion of control over events and that you are being allowed to explore where you want to. That is, after all, the key feature of gamebooks, that you are in the driving seat not some passenger on some Disney ride. What was the hardest thing about writing the gamebooks? Getting the challenge level right. Particularly when it comes to riddles and puzzles, what is impossible for one person might be trivial for another. My solution was to make these optional challenges - completing them would make finishing the game much easier but it would still be possible if the puzzle was left unsolved. What was the most exciting thing about writing the gamebooks? Being able to create an environment for players to interact with. I love placing secrets for people to discover. You have recently released book 2 online. Do you have plans to release your books on other platforms? The books are currently available as paperback and on kindle. We want to release them in other digital formats so that it is available on all eReader devices. We also want to release them as apps for Android and iOS devices but this is still in the planning stage. I want to write book 3 and continue Toby's story. One of the fun things about the Adventure Begins Here series is that the story doesn't end at the end of the book. Any accomplishments carry through to the next adventure. We are also planning a new gamebook series aimed at younger readers. This will be much simpler, focussing more on the writing but they will still be edgy and exciting. At the moment we are looking for people to collaborate with be that illustrators or writers and we are always keen to hear any ideas that they have for new and exciting adventure stories. You can get the Your Adventure Begins Here books here. 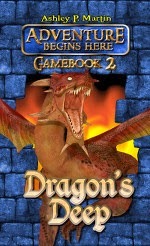 You can play Dragon's Deep online here.